Nioxin uses advanced technologies to deliver thicker, fuller, denser-looking hair. The company's commitment to innovation, supported by research, enables Nioxin to help more than 50% of people worldwide who experience thinning hair. When founder Eva Graham experienced her own hair thinning after the birth of her first child, she began to investigate treatments that targeted not only the hair but also the scalp. The products available at the time were less than effective, and many men were experimenting with drug-based remedies with limited success. Therefore, in 1987, Graham founded Nioxin Research Laboratories, and The Science of Living Hair products started showing up in salons. Nioxin products were the first on the market to address the unique needs of the scalp as well as the hair. Over the next 30 years, Nioxin developed a wide variety of effective formulas to gently clean, rejuvenate, and stimulate both the scalp and hair. The company strove to educate hairdressers and beauty professionals in identify their clients’ needs and providing the best treatment recommendations. For 14 straight years, Nioxin has been voted Favourite Fine/Thinning Hair Line at the Stylist Choice Awards by stylists and clients. Today, Nioxin is available in over 30 countries and continues to be one of the fastest-growing product lines for thinning hair. Which Nioxin range is right for me? 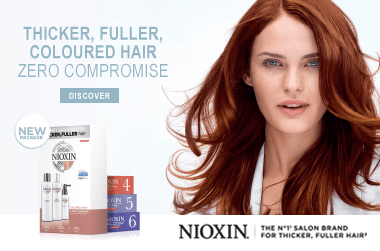 With six different systems, it can be confusing to work out which Nioxin products are right for your hair type! Designed for natural hair with light thinning, System 1 amplifies hair texture and protects hair against breakage. Nioxin’s System 2 is perfect for natural hair with progressed thinning. It delivers thicker, fuller hair, while protecting every hair strand against damage. Ideal for coloured hair with light thinning. This range leaves hair thicker, denser-looking and with a vibrant color. Designed for coloured hair with progressed thinning. System 4 helps you achieve thicker, fuller-looking hair and restore moisture balance. For chemically-treated hair with light thinning. System 5 is designed to deliver fuller-looking, moisturised hair. For chemically-treated hair with progressed thinning. This range will help you achieve noticeably smoother and denser-looking hair. Showing 20 products of 46. This has definitely helped me get my hair in a better condition and have noticed a massive difference since using this in my weekly treatment routine. I haven't been using this for very long so I can't comment on the hair growth aspect but as a shampoo it is great. It is very cleansing but doesn't dry out the hair. The peppermint smell is refreshing and the tingle is quite a nice feeling. Brought this months ago only to learn now I paid for a counterfeit item. God knows what I was putting into my hair!! !